We would like to welcome you to our Jewish Center. 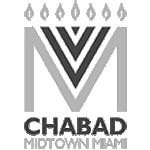 Tucked in between the ‘Miami Design District’ and the ‘Wynwood arts District’, Chabad at Midtown serves as a Spiritual oasis for many who live and work in this vibrant neighbourhood. We are a “Jewish Space” where young dynamic people meet and connect and a place to reconnect to your soul and spirit. Whether you would like to join us for Shabbat Services, Holiday celebrations, women’s group or Judaism classes we trust that you will enjoy our special, inclusive environment where everyone feels comfortableand welcome. We invite you to join us as a member and look forward to sharing many meaningful experiences together. Please feel free to contact us at 305-573-9995 should you need assistance filling this form or more information. *All contributions are tax deductible and can be paid throughout the year. No one is turned away for lack of funds. If you cannot afford the full amount requested, contact the Rabbi for a confidential arrangement.